How to Spend Your Scottsdale Staycation. We are at the tail end of summer here in the valley, but if you haven’t made any vacation plans yet, don’t sweat! Well, don’t sweat any more than you already are out here in the desert. A staycation is the perfect way to spend an inexpensive weekend “away but not away” with your family. What is a staycation? It’s just like a vacation, but you spend it at home, which cuts down on all the money you would potentially have to spend on airfare and hotels. And the best part of a staycation is that you can be a tourist in your own hometown, see sights you don’t usually see, and do things you don’t usually do. The Scottsdale area is rife with free and inexpensive things to do on a long, weekend staycation. Have a sports fan in the family? Then relive the greatest moments in Fiesta Bowl History at the Ellie & Michael Ziegler Fiesta Bowl Museum. The museum features exhibits with memorabilia from Fiesta Bowl games and events, all 128 FBS team trophy helmets, and some of college football’s most prestigious award trophies. 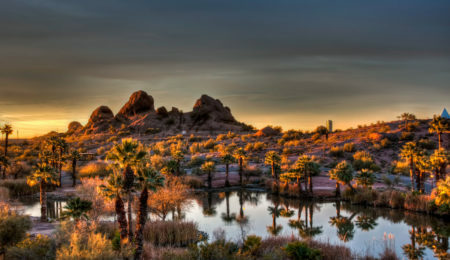 Or spend the day exploring Papago Park by foot or on a bike. The park features an archery range, exercise course, fishing lagoons, baseball facility and softball complex. 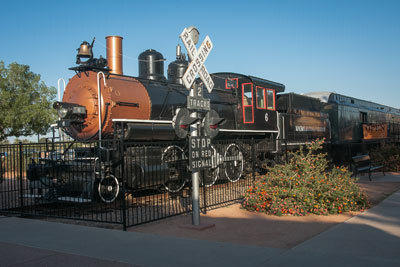 And located in the heart of Scottsdale is the McCormick-Stillman Railroad Park, which boasts a combination of free and inexpensive things to in the 30-acre facility, including train and carousel rides, the Scottsdale Railroad Museum, and Hartley’s General Store. Are you an early riser and avid outdoors-person? 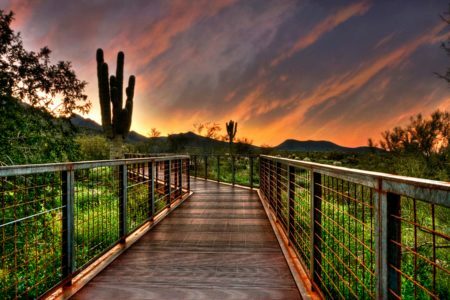 Spend your morning at the McDowell Sonoran Preserve’s Gateway Trailhead. Located just east of the Loop 101’s Frank Lloyd Wright and Bell Road exit, Gateway has three hikes for all levels of experience, including the Horseshoe Loop (1.7 miles/100 ft. elevation gain), the Bajada Nature Trail (0.5 miles/0 ft. elevation gain), and the Gateway Loop (4.5 mi./650 ft. elevation gain). A complete list of trailheads within the McDowell Sonoran Conservancy available on McDowellSonoran.org. Looking for a casual and eclectic way to spend a Thursday evening? Head to the heart of Old Town Scottsdale for the Scottsdale ArtWalk hosted by the Scottsdale Gallery Association. Not only is the ArtWalk a great place to see the array of artistic styles represented in Scottsdale galleries, but it is a fantastic place to meander and “people watch”. ArtWalks are free to the public all year every Thursday evening from 7:00pm-9:00pm along Main Street from Scottsdale Rd. west to Goldwater Blvd., and on Marshall Way north of Indian School Rd. to Fifth Ave.
For a day full of crafting, education, and fun, head over to the Scottsdale Public Library, which hosts an abundance of free events. From story time, LEGO Camp, guitar club, yoga story time, office hours with the Writer in Residence, the Scottsdale Public Library has no shortage of fun and exciting offerings for each and every member of the family. 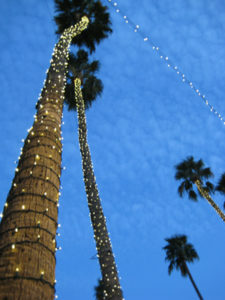 A complete calendar of events hosted by the Scottsdale Public Library available here. The other best part of staying local for your vacation: the food. 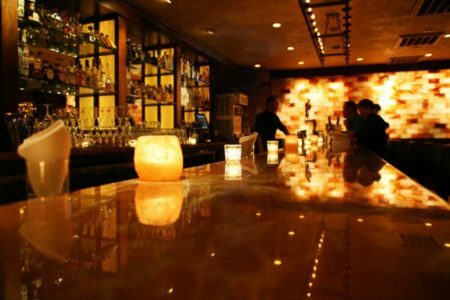 Scottsdale has some of the most popular restaurants in the state at all price points. Interested in a classic, Chicago-style hotdog? Then check out Portillo’s. The grand opening of the Scottsdale store saw lines of over 500 people. Check out the menu here: http://www.portillos.com/all-menus/. Want dinner with a side of sports memorabilia? Located just outside of Old Town, Don & Charlie’s has been serving prime steak, BBQ baby back ribs, BBQ chicken, and more since 1981. The walls are covered with hundreds of pieces of sports memorabilia that showcases the history of college and professional sports in the state of Arizona and beyond. For a more casual take, Cold Beers & Cheeseburgers has two Scottsdale locations (Old Town and Central), and is a great place to take in a bite and the game. Both locations have specials and events all summer long. Or, beat the heat by heading underground to The Salt Cellar, a Valley landmark since it opened in 1971. The Salt Cellar is known for its selection of whole Maine lobster, and an extensive menu to satisfy every craving. Early riser? Head on over to Butterfield’s Pancake House on Shea Boulevard for breakfast, brunch, or lunch, with a menu that caters to every taste. Looking for something in Old Town? Try Arcadia Farms Café for breakfast, and when you’re done, head over to the Arcadia Farms Marketplace for a gourmet selection of fresh-baked pastries and desserts. If you’re looking to grab a quick, healthy bite for lunch, try the Original Chop, which also has locations in both Tempe, Chandler, and a new location in Queen Creek. Another restaurant that caters to healthy, delicious eats is True Food kitchen (http://www.truefoodkitchen.com/), which is located in the heart of Scottsdale Quarter, Scottsdale’s open-air shopping mall. 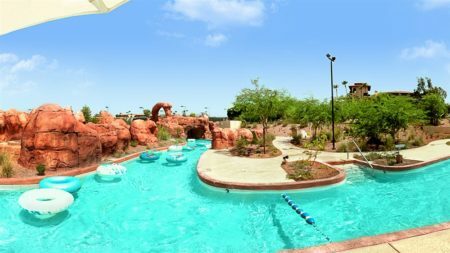 And if you think you can’t properly “get away” while staying at home, many hotels in the Scottsdale area offer deals to area residents who want to take just one step away from home, without actually getting all the way out of town. Be on the lookout for the Fairmont Scottsdale Princess, which is hosting a Labor Day Dreamcation (Sept. 1-4) in conjunction with its 30th birthday, while the W Scottsdale Hotel a deal for local residents, as well as the JW Marriott Camelback Inn. Looking for something a little more family friendly? 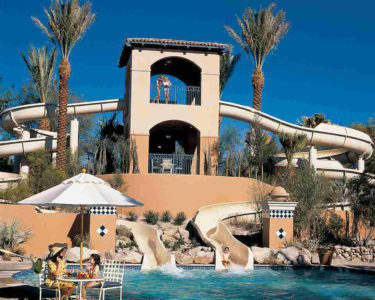 Head on over to the Arizona Grand Resort, which boasts the seven-acre Oasis Water Park and eight-story Slide Canyon Tower. 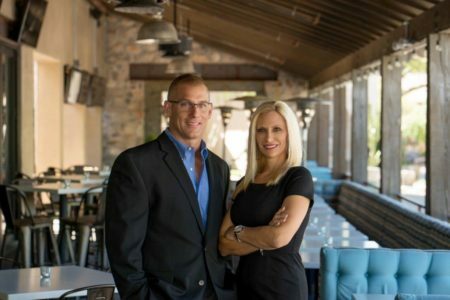 The Panozzo Team is dedicated to educating our clients on the process of buying and selling real estate. Whether you are looking to sell your home or buy a home, working with an experienced realtor who specializes in your desired market will make all the difference. The Panozzo Team takes the stress out of buying and selling a home. We want to be your Scottsdale realtor for life. PreviousPrevious post:13 July Family-Friendly Events in ScottsdaleNextNext post:Total Sales and Average Sales Prices up from 2016!